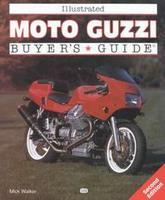 Moto Guzzi motorcycle books cover the history, racing and various Moto Guzzi models. Moto Guzzi, also known as Guzzi, is an Italian motorcycle manufacturer that has endured from the industry's infancy to its place today as the oldest European manufacturer in continuous motorcycle production. Moto Guzzi: Gold Portfolio 1949-1973 by R M Clarke (1997) contains 48 articles including road test reports from such popular magazines as Cycle World, Motorcycle and Motorcycle Mechanics. Chapters cover: Zigolo, Lodola, Single V-Twin, V7, V8, Ambassador and Eldorado. Plus articles on new model reports, performance data, history, service notes, engine analysis, specs and tuning. Moto Guzzi Le Mans Performance Portfolio 1976-1989 by R M Clarke (2000). Reprinted articles from major magazines Modern Cycle, Cycle World, Motorcyclist and others deal specifically with these popular Moto Guzzi models. Filled with road and comparison tests, specs, model introductions and performance data on the 1000 Magni, Le Mans Mks I, II and III, CX 100, and V 850s and 1000s. 80 Years Of Moto Guzzi Motorcycles by Mario Colombo (2000). All the information you could ever want about the Moto Guzzi history of the first 80 years. Rare pictures of pre-production models or models that never made it into the showrooms. Also military models are well covered. Racing gets it separate attention as well. 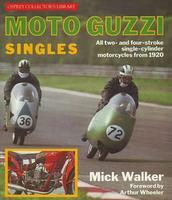 Moto Guzzi The Complete History From 1921 by Mario Colombo (2000). A review of current production, it covers the industrial and competitive history of Italy's number one motorcycle marquee in terms of model variety and racing laurels. It includes a complete and accurate catalogue of all the models, which represent the entire span of Moto Guzzi production, including the V 11 Le Mans, the last versions of the California, the MGS 01 Corsa, the Griso, the Breva, the Norge, the 1200 Sport as well as the 940 Custom. Moto Guzzi 750, 850 And 1000 V Twins Owners Workshop Manual by Mansur Darlington (1977). Models covered: 750S, 750S3, 850T, 850T3 and California, 850Le Mans, V-1000 1 - Convert. 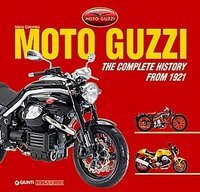 The Moto Guzzi Story : Racing And Production Models From 1921 To The Present Day by Ian Falloon (1999) describes the history of the Moto Guzzi company, including the remarkably long-lived designs such as the 500cc Falcone (in production from 1950 to 1976) and the V7, produced from 1966 to the present day (as the V11). In addition there is information on Moto Guzzi road and competition products. 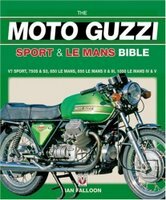 The Moto Guzzi Sport & Le Mans Bible by Ian Falloon (2007) covers the period 1971-1993 and all models (V7 Sport, 750S, 750S3, 850 Le Mans, 850 Le Mans II, 850 Le Mans III, 1000 Le Mans IV, 1000 Le Mans V) and with description of model development year by year, full production data and 150 photos this is a highly informative book and an essential Bible for enthusiasts. 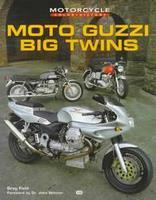 Moto Guzzi Big Twins by Greg Field (1998) is the first detailed colour history of the legendary Italian motorcycle makers. 'Big Twins' - those bikes powered by engines rated 700cc and larger. Moto Guzzi: Forza In Movimento by David Styles (2000). For over 70 years the company has produced innovative, practical, stylish and exciting machines that have caught the imagination and won races all over the world. Along with Ducati, Moto Guzzi represents the best in the Italian motorcycling tradition of imaginative engineering and high performance. David Styles' pictorial provides a fascinating, authoritative account of the Moto Guzzi company and its extraordinary motorcycles. 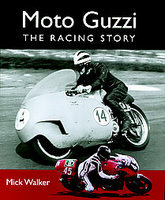 Moto Guzzi: The Racing Story by Mick Walker (2005). Moto Guzzi has the most star-studded history of any Italian motorcycle marque, and in no sphere of its activities is this more marked than in racing. Quite simply, no other factory has managed to equal what Moto Guzzi has achieved since it began in 1920. 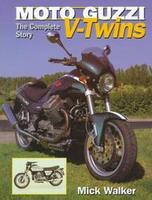 Moto Guzzi V-Twins: The Complete Story by Mick Walker (1998). Moto Guzzi have built single, twin, triple, four, and even V-8 engines, but the 90-degree V-twin has dominated the Italian company's activities. 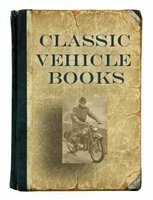 This study of the V-twin covers: background history of the motorcycles; development history through to models of the 1990s; and full specifications. Moto Guzzi Twins Restoration: All Moto Guzzi V-Twins, 1965-2000 by Mick Walker (1999) book provides all the appendices, pointers on model recognition, paint schemes, and hands-on tips that any restorer or enthusiast needs to know about engines, frames, electrics, suspension, wheels, brakes, and tyres. The entire extended family of these Italian classics is covered: the T-series, Le Mans and Lario Sportsters, Strada tourers, Nevada and California custom cruisers and Quota enduro machines. Moto Guzzi 1000SP Motorcycle Road Test/Sales Literature (1983) Reprinted from Rider Magazine. Moto Guzzi 1000 California III Motorcycle Sales Literature An excellent full colour showroom brochure of this Guzzi touring model. Lots of good detail and specs. Moto Guzzi G5 Sales Full Colour Literature (1977) An excellent showroom brochure of this rare Guzzi model. Moto Guzzi Motociclo Tipo Astore 500cc 1950 Operating Manual. Italian text. Check for the manual you need from more Moto Guzzi Manuals here.